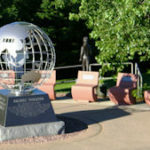 Dedicated in 1993, the stainless-steel globe represents the broad reach of the conflict and the world's involvement in this war which touched every continent in some way. Stained glass campaign ribbons are mounted in their appropriate locations representing the various theaters of action. The globe measures five feet in diameter and is illuminated from the inside at night. The granite base on which the globe rests is four-sided. One side displays the "Kilroy was here" imagery and story; another is emblazoned with the "Ruptured Duck" emblem as seen in this photo; the remaining sides list the major battles fought in the Pacific and European Theatres. The surrounding area is dedicated to World War II and includes a picnic area. A grassy area for events and a raised area for a future World War II Wall.